Falkenbach is a one man project formed by Vratyas Vakyas. Vratyas Vakyas recorded his first Demo tape and released it with the title Havamal. It had three tracks and was limited to 9 copies. During the years till 1994 Vratyas was the guitarist player of Crimson Gates, which released two demos (unreleased). Crimson Gates decided to split up in 1994. In 1995 Vratyas reocrded the tape "Laeknishendr", containing 6 old re-recorded tracks. 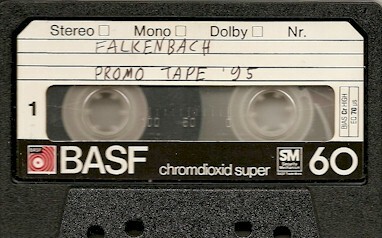 Also in 1995 the recording session of Falkenbach's debut album "The Fireblade" began, due to heavy problems with the studio equipment Vratyas decided to stop the session a short while before the mix. "Heralding - The Fireblade" was later released in 2005 completely recorded and released. In March 1996 Vratyas recorded an completed the debut album. "...En Their Medh Riki Fara..." was released via NCR. There are nine demo tapes all in all. Most were strictly limited to nine copies only, as they were not mentioned for a greater audience. The only exceptions are Laeknishendr, which was released in 1995 which was sent out to a couple of fanzines and people who ordered it, and the tape called Promo '95, released through No Colours Rec. Xeroxed covers. Regular tapes. Released by No Colours Records. About 150 copies were sold.